According to the USDA, the average amount an American family spends on a month's worth of food for a family of four is between $771.10 and $916.30. Children up to 14 years old cost an average of $305 a month, so a family of six should realistically cost anywhere from $1,200 to $1,500 per month, depending on the age of the children. This may seem a little high, as it's for one of the more liberal plans put forth by the USDA; the most thrifty plan would probably cost somewhere around $700-$900 per month, depending on the age of the children. Cheaper budgets can be made by substituting certain meals and foods that are more expensive then others--yet are still just as nutritious--and by keeping close track of what you buy and consume as a family. Frozen foods, which can be bought from healthy grocery stores such as Whole Foods and Trader Joe's, keep for long periods of time in the freezer, as opposed to fresh foods that can go bad in a week or two. These can range from full meals to small meals to snacks for the kids. Eating large meals a couple times a day isn't necessarily the healthiest way to eat--or the most economical. Small, healthy snacks will break up bigger meals, is better for everyone's metabolisms and can make more use out of less food. For example, a bag of lettuce and veggies can be served in individual portions for a salad for a small meal in the middle of the day with equal servings, as opposed to a family style meal, which everyone may not eat. These small meals and snacks will help you keep track of what your family is consuming. If $125-$150 is spent per week on groceries for the entire family, then eating out at a decent restaurant for a family of six will cost around $70-$90, which means you can eat out about once a week as a family if you're looking to spend under $800 a month on food for a family of six. The amount you're able to spend per month, the age of your children and the places you are going out to eat all factor into these final figures. If you have the good fortune of living near farmers markets or stores that sell locally grown fresh food, they will also carry these types of produce and food. 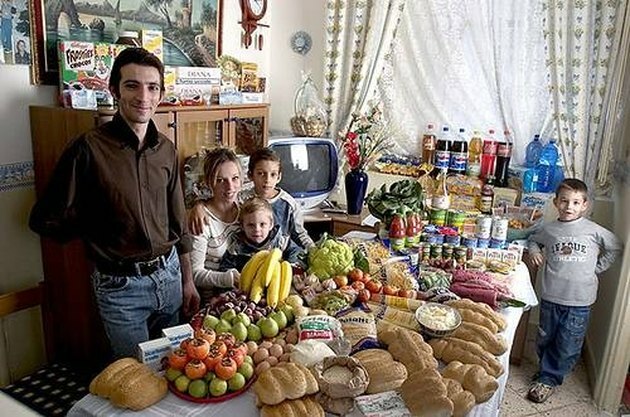 The cost of a sustainable food diet for a family of six is estimated at $838 dollars a month, according to the crunchychicken.com blog. Another way to save money for the family of six is to map out everyone's schedules and figure out when the family is going to eat together, what they are going to eat and how much it is going to cost. With planning and foresight, certain ingredients for meals can be bought in bulk. This is a bit of work and is unpredictable, as schedules regularly change over the course of a month.